Studio shots, no, 1: M. John & Delphia Locus. 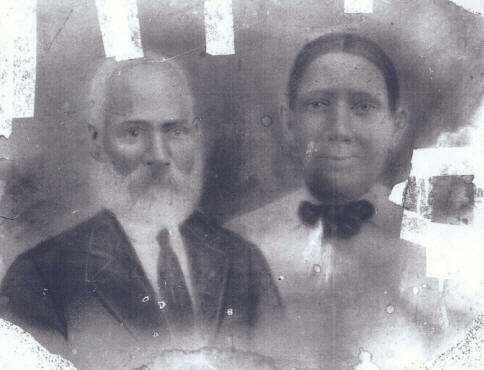 Martin John Locus (1843-1926) and Delphia Taylor Locus (1850-1923). John was the son of Martin Locus and Eliza Brantley Locus of southeastern Nash and later western Wilson County. Delphia was the daughter of Dempsey Taylor and Eliza Pace Taylor of northern Nash County. Their children included John Frank Locus (1869-? ), Dora Locus Battle (1872-? ), Kenyon Locus (1874-1940), Nancy Locus Deans (1875-? ), Samuel Locus (1880-? ), Edward Locus (1885-1847), Sidney Locus (1885-1955) and Susan Locus Ellis (1890-1980). 1920 federal census, Taylors township, Wilson County. Many thanks to Europe A. Farmer for the photograph. ← Homestead Grays at spring camp.